Love is life! In the great St. Valentine’s event in Cats Empire, you can collect nice rewards and design your yard with a cute cat cupid statue, you can level up by playing the game! The maximum visual level of the cat cupid statue is 10. Until level 10 your statue continuously changes its appearance! You can increase the statue level by collecting rarities while raiding enemy yards. 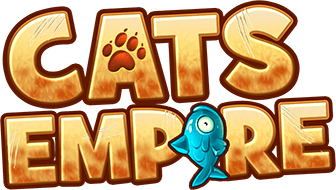 The rarity items are different for each event in Cats Empire. For St. Valentine's event you need to collect hearts. You can obtain hearts by neutralizing enemy cats. You will be instantly rewarded with your rarities and they will be automatically added to your statue progress. With events, you also have the opportunity to collect a nice costume set. Of course, for St. Valentine’s it is a 4 piece angel costume: A cloth, cheekies, halo hat and winged sandals! Cats always go in style! This event costume provides +20 % tournament points for each piece (up to a toal of 60 %) and +20% to boss damage, so you should focus on playing during events.